Step 1. Toning with acrylic over my pencil sketch. Step 2. 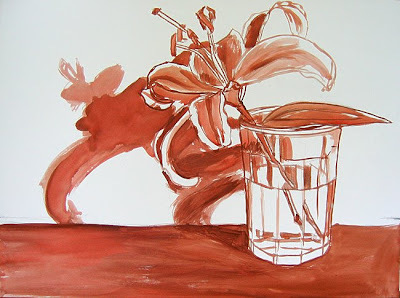 Orangey acrylic wash applied over top of sketch. No more white. Step 3. First level of oil color blocked in. The Slug is back. That has been me for over 2 days. Friday, I didn't even get out of my pajamas, or bed, for that matter. Kind of a flu/cold thingy. Nature's way of saying that burning the candle at both ends never works. So...today I'm in clothes (not very cute clothes, but clothes nevertheless) and needing to do something but watch the food channel and taped episodes of American Idol. 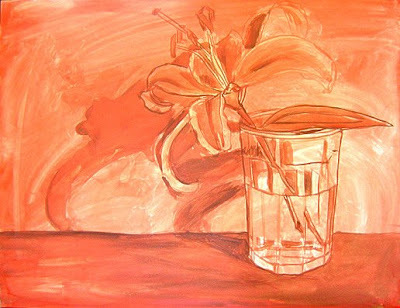 I'm posting the acrylic part of this lily still life. 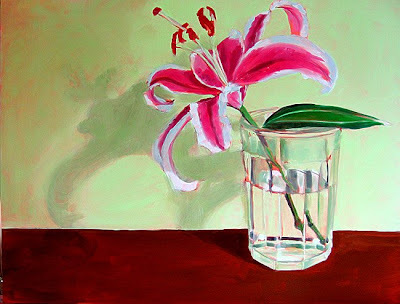 Once it's dry, I will start working in oil. It's on (as usual) gessobord. The size is 18" x 24". I like working with glass reflections and lately the itch to do one or two has been getting the better of me. So, stay tuned while I'm busy scratching that itch!